Lavender is a great signature plant for a garden wedding. In many areas it will be in bloom in mid-summer and/or fall. You can buy fresh or dried lavender to tuck into bouquets, boutonnieres, corsages and arrangements. And the array of lavender scented favors and gifts ranges from sachets to soaps or candles and beyond. And because lavender has long been valued for it’s calming properties, it might be the best thing to give everyone in the wedding party! A box of lavender sachets at the Cape Cod Lavender Farm in Harwich. 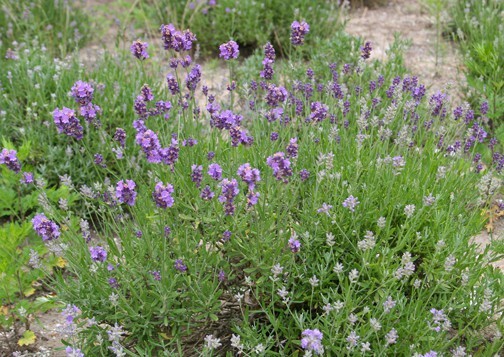 If you want to plant lavender in the garden, be sure to choose a place that gets full sun. You’ll want at least six hours including the noon hour for this perennial to thrive. If the plants are next to a stone wall or gravel driveway that’s even better, as this plant wants heat! 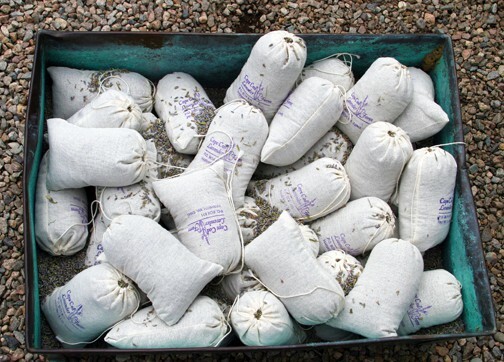 Grow lavender in well-drained soil that is on the neutral to alkaline side. Water deeply but less often – no splashing from an automatic sprinkler system for this plant! Go easy on the fertilizer and compost too – this perennial does better on a leaner diet. After the plant finishes flowering, cut off the old flower stems and an inch or two of the foliage to encourage bushy growth and repeat flowering. Lavender combines well with roses and other perennials in the sunny garden and looks great planted in groups of five or more.